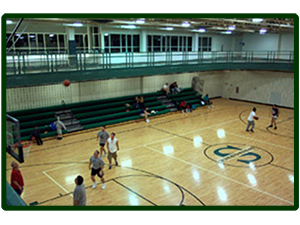 Enjoy the spring weather and get some friends together and play basketball at one of the three (3) full-size courts in the Community Center. Get out and practice your swing! The batting and golf cages are for use by all Community Center members. Users must be trained on the batting machine prior to the first use and an adult must be present to operate the batting machine. Call ahead for reservations. Limit one hour of use per member. Members and guests of any age may use one of the computers in the room to work on school projects, resumes or surf the internet. All computers are equipped with Word, Excel and Publisher. A printer is also available for your use; however we ask that you provide your own paper. Members and their guest must sign in and present their card at the front desk to use this room. Adults ages 18 and older that want a quieter environment to play pool or darts will enjoy the adult game room. The Family Game Room has a wide variety of games the whole family will enjoy. Table tennis, air hockey, foosball, and shuffleboard may be played free of charge. Members may check out game room equipment at the front desk. For your enjoyment, the game room also contains arcade games, a television, as well as tables and chairs. There are two (2) racquetball/wallyball courts available to Community Center members. Wallyball courts can accommodate up to eight (8) players. Court time is free for those with a Racquetball Membership, however the fee is $4 per court per hour for Community Center members who do not have a racquetball membership or a racquetball member with a guest. Courts may be reserved up to 72 hours in advance for up to one hour. An individual may make only one reservation per day. Reservations are made on the half-hour during normal hours of operation. Players must provide equipment including eyewear. Located in the locker rooms, patrons 16 years and older may enjoy the sauna. Please do not pour water on the sauna rocks. Senior Lounge This room is a great area for seniors to watch a movie, play cards or read a book! This room is only for senior members and their guests, and includes comfortable leather furniture, computers with internet, an LCD TV with a home theater system, card tables, and a kitchenette. The 1/12 mile elevated track and access elevator are available for use by members and their guests age 16 and older. Children under 16 years of age may use the track when accompanied by an adult. Parents must keep their children with them at all times while using the track. As a courtesy to other members and for your own safety, slower traffic should use the inside lane. 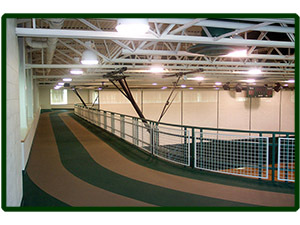 Membership cards must be presented at the front desk prior to utilizing track.